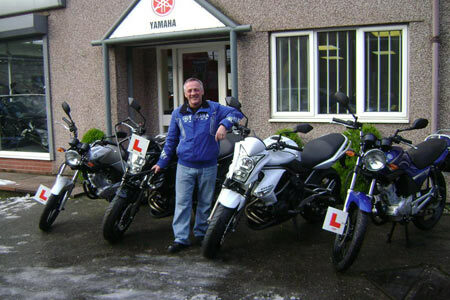 Peter Cairns Motorcycle Training is an established business, owned and managed by Peter Cairns - who in the past has trained a large number of learners to gain their full licence in the old, and now the new motorcycle test. As Peter has trained for a number of years a lot of his business comes from recommendations and dealers. He is DSA Approved and is qualified to teach CBT and Direct Access courses, and is also an approved post motorcycle trainer on the Enhanced Rider Scheme. All of our motorcycles are modern and are supplied and maintained by J & L Motorcycles as is all of our equipment. The hire of the motorcycles and equipment is included in the price of the relevant course you wish to take. Above all, the safety of our pupils is very important to us and therefore our training is geared to achieve this aim. We also believe that your training should be enjoyable and totally satisfying, we will train you to a high standard above test level so even when you pass your test you will have the skills to negotiate any obstacle. “My husband and I both trained with Peter Cairns and successfully passed our tests in 2008 and 2009 respectively. We chose the Direct Access course which suited us both well. Peter Cairns is an incredibly dedicated instructor who puts you first. It is clear that Peter loves what he does and he trains you to the highest standard – in fact – to a higher standard than is required for the test. Peter is honest and straight with you – what you see is what you get – he invests in his pupils fully and has total confidence in their abilities – even when you doubt yourself Peter knows you better – trust him ! We are both grateful to Peter for his expert advice, tuition and support and for opening up news doors for us – roll on the summer……"
Gary and Julie Waning, Carlisle.